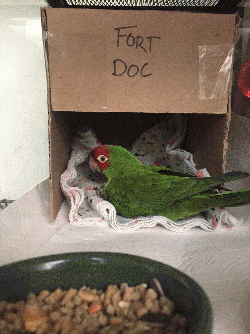 Hi, I`m Doc and I was found in Pinole in someone`s yard, starving and dehydrated. A nice lady called Mickaboo and one of their volunteers came to pick me up and take me to the ER in San Francisco. I ate like crazy for a few days at the regular birdie vet, and now I am ready to go home to some nice person who wants to adopt or foster me. Would that be you by chance?